Why my Windows desktop gadgets not working or not displaying properly? How to fix the subkey with foreign/ASCII character exists under the "Zones" registry key? How to fix the XML registration is missing in the system? How to delete the Windows Sidebar Setting.ini file and all gadgets file? Why my Windows desktop gadgets don't start up automatically? How to close Windows desktop gadget? How do I uninstall a Windows desktop gadget? 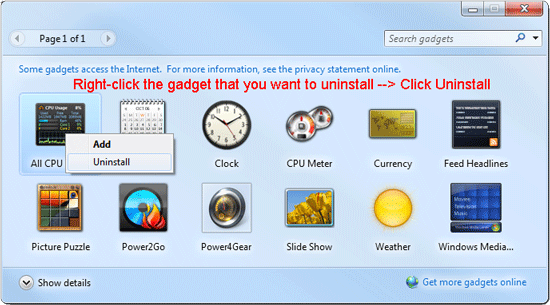 How to disable or turn off Windows desktop gadgets on Windows 7? How to turn on Windows desktop gadgets on Windows 7? How to change a Windows desktop gadget's options? How to resize a Windows desktop gadget? 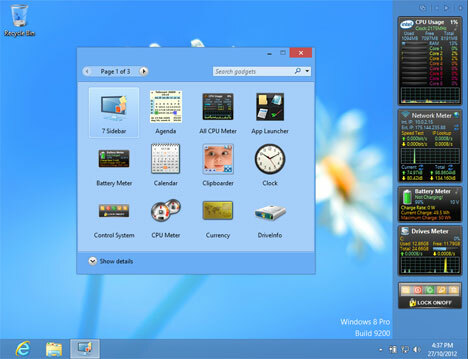 How to always keep Windows desktop gadgets on top of your windows? How to bring Windows desktop gadgets to the front by using a keyboard shortcut? How to tab through Windows desktop gadgets by using a keyboard shortcut? How to hide Windows desktop gadgets on the desktop? How to show gadgets on the desktop? How many Windows desktop gadgets i can install? How to stop something is downloading in the background without my permission? Why my GPU Meter doesn’t work? How to fix WMIPRVSE.exe using 100% CPU Usage or cannot collect the data? How to fix the disk performance monitoring in the registry was set to disabled? How to running (install) the PC Meter? 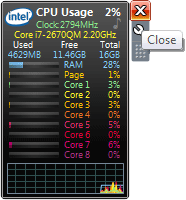 How to uninstall the PC Meter? How to make PC Meter run on Windows startup? 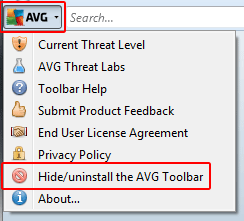 How to uninstall the AVG Toolbar? To enable Windows 8 or Windows Server 2012 Gadgets you have to run 3rd party software called 8GadgetPack. 1. A subkey with foreign/ASCII character exists under the "Zones" registry key. How to fix? 2. XML registration is missing in the system. How to fix? 3. Something went wrong with Windows Sidebar Setting.ini file and gadgets file. How to delete? Click Start or press Windows key --> Type Regedit.exe and press Enter. Under the Zones key right click the ASCII character --> Click Delete --> Click Yes --> Restart your computer. Click Start or press Windows key --> Click Start --> Click All Programs --> Click Accessories --> Right-click Command Prompt --> Click Run as administrator. In the Command Prompt window type regsvr32 msxml3.dll --> Press ENTER --> Click OK --> Type regsvr32 scrrun.dll --> Press ENTER --> Click OK --> Type regsvr32 jscript.dll --> Press ENTER --> Click OK --> Restart your computer. The following step will delete all your gadgets. Click Start or press Windows key --> Type taskmgr.exe --> Press ENTER --> Click tab Processes --> Right click sidebar.exe --> Click End Process. Click Start or press Windows key --> Type %LOCALAPPDATA%\Microsoft\Windows Sidebar\ --> Press ENTER --> Delete all Gadgets file and Setting.ini. Maybe you have disable or turn off Windows desktop gadgets. To turn on click Start or press Windows key --> Click Control Panel --> Click Programs --> Click Programs and Features --> Click Turn Windows features on or off --> Click the checkbox from Windows Gadget Platform --> click OK --> Restart your computer. Right-click the gadget that you want to close, and then click Close. From the gadgets menu right-click the gadget that you want to uninstall --> Click Uninstall. Click start or press Windows key --> Click Control Panel --> Click Programs --> Click Programs and Features --> Click Turn Windows features on or off --> Remove the checkbox from Windows Gadget Platform --> click OK --> Restart your computer. Click start or press Windows key --> Click Control Panel --> Click Programs --> Click Programs and Features --> Click Turn Windows features on or off --> Click the checkbox from Windows Gadget Platform --> Click OK --> Restart your computer. Right-click the gadget that you want to change, and then click Options. Right-click the gadget that you want to resize --> Click Options --> Choose size --> Change the percentage you want the gadget to be. Right-click a gadget --> Click Always on top. 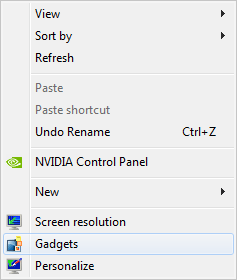 Press the Windows Logo key + G.
Press the Windows Logo key + G, and then continue pressing G to select the gadgets. Right-click the desktop --> Point to View --> Click Show desktop gadgets. First scan the computer using the latest antivirus, Anti-Spyware and Anti-Malware programs. Second close all programs (i.e. Internet Explorer, Skype, etc). Third you should be concerned with all programs that start automatically then disable the program and restart the computer. Click Start --> click Run or Search promgrams and files --> then type: MSCONFIG and click OK --> click Startup tab --> uncheck the programs you don't want to start when your computer boots (do not uncheck your antivirus program) --> click OK --> then restart the computer. Because it request running the PC Meter in background each time you use the GPU Meter Version 2.0. Click Start --> Click All Programs --> Click Accessories --> Right-click Command Prompt --> Click Run as administrator --> In the Command Prompt window type lodctr /r --> Press ENTER. If you find a value named Disable Performance Counters listed there and the value is 1 (mean disable) just change it to 0 (mean enable) and then restart the computer. PC Meter is use for detect the graphic card information, CPU temperatures and processor turbo frequency (Overclock). To uninstall just delete all the PC Meter file. To make PC Meter run on Windows startup: Open PC Meter --> Click Options --> Select Run On Windows Startup. If PC Meter still can't run on Windows startup you can try use this startup folder method: Click Start or press Windows key --> Click Start --> Click All Programs --> Right click Startup --> Click Open --> Right click on Startup Windows Explorer --> Select New and click Shortcut --> Browse the PCMeterV0.3.exe --> Click Next -- Click Finish to save. The PC Meter will run on the next Windows Start. Method 1: Use the Hide/uninstall the AVG Toolbar option in the AVG Toolbar menu. Method 2: Click start or press Windows key --> Click Control Panel --> Click Uninstall a program --> Right click AVG Security Toolbar in the list --> Click uninstall.